Cytotoxicity assays to measure natural killer cell lytic responses to HIV-infected cells is limited by the purity of the target cells. We demonstrate here the isolation of a highly purified population of HIV-1 infected primary T-cell blasts by taking advantage of HIV-1 s ability to down-modulate CD4. Davis, Z. B., Ward, J. P., Barker, E. Preparation and Use of HIV-1 Infected Primary CD4+ T-Cells as Target Cells in Natural Killer Cell Cytotoxic Assays. J. Vis. Exp. (49), e2668, doi:10.3791/2668 (2011). Natural killer (NK) cells are a vital component of the innate immune response to virus-infected cells. It is important to understand the ability of NK cells to recognize and lyse HIV-1 infected cells because identifying any aberrancy in NK cell function against HIV-infected cells could potentially lead to therapies that would enhance their cytolytic activity. There is a need to use HIV-infected primary T-cell blasts as target cells rather then infected-T-cell lines in the cytotoxicity assays. T-cell lines, even without infection, are quite susceptible to NK cell lysis. Furthermore, it is necessary to use autologous primary cells to prevent major histocompatibility complex class I mismatches between the target and effector cell that will result in lysis. Early studies evaluating NK cell cytolytic responses to primary HIV-infected cells failed to show significant killing of the infected cells 1,2. However, using HIV-1 infected primary T-cells as target cells in NK cell functional assays has been difficult due the presence of contaminating uninfected cells 3. This inconsistent infected cell to uninfected cell ratio will result in variation in NK cell killing between samples that may not be due to variability in donor NK cell function. Thus, it would be beneficial to work with a purified infected cell population in order to standardize the effector to target cell ratios between experiments 3,4. Here we demonstrate the isolation of a highly purified population of HIV-1 infected cells by taking advantage of HIV-1's ability to down-modulate CD4 on infected cells and the availability of commercial kits to remove dead or dying cells 3-6. The purified infected primary T-cell blasts can then be used as targets in either a degranulation or cytotoxic assay with purified NK cells as the effector population 5-7. Use of NK cells as effectors in a degranulation assay evaluates the ability of an NK cell to release the lytic contents of specialized lysosomes 8 called "cytolytic granules". By staining with a fluorochrome conjugated antibody against CD107a, a lysosomal membrane protein that becomes expressed on the NK cell surface when the cytolytic granules fuse to the plasma membrane, we can determine what percentage of NK cells degranulate in response to target cell recognition. Alternatively, NK cell lytic activity can be evaluated in a cytotoxic assay that allows for the determination of the percentage of target cells lysed by release of 51Cr from within the target cell in the presence of NK cells. Peripheral venous blood (40 to 60 mLs) is collected into Vacutainer Tubes containing sodium heparin (Becton Dickenson). The peripheral blood is then transferred from the Vacutainer Tubes to 50 mL polystyrene conical tubes (20 mL of blood per tube). RosetteSep CD4+ T-Cell isolation reagent (StemCell Technologies) is added in a 1 mL volume to no more than 20 mL of blood in a 50 ml tube and mixed well. The mixture is then incubated at 20-25°C for 20 minutes. After 20 minutes, calcium and magnesium-free (CMF) phosphate-buffered saline [PBS (HyClone] w/2% heat-inactivated (56°C for 30 minutes) fetal bovine serum [FBS (HyClone)] is added to the mixtures in order to achieve a final volume of 40 mL . The diluted mixtures (30 ml) are then layered on top of 15 mL of Lymphocyte Separation Medium [LSM (Cellgro)] in fresh 50 mL polystyrene conical tubes. The 50 mL tubes are then centrifuged at 1200 x g for 20 minutes with the brake off. The 50 mL tubes are removed from the centrifuge carefully, so that the interface between the LSM and medium is not disturbed. The cells at the interface are collected with a 10 mL pipette and placed into fresh 50 mL polystyrene conical tubes. The collected interfaces are diluted with PBS w/2% FBS to a final volume of 50 mL. The 50 mL tubes containing the diluted interfaces are centrifuged at 1200 x g for 10 minutes with the brake on. After centrifugation, the supernatants are aspirated and the pellets resuspended in 10 mLs of PBS w/2% FBS. The cell suspensions are then combined into a single 50 mL conical tube and diluted to 50 mLs with PBS w/2% FBS. The tube containing the combined cell suspension is centrifuged at 300 x g for 10 minutes to remove all remaining LSM. The supernatant is aspirated and the pellet is then resuspended in 10 mLs of RPMI-1640 medium (HyClone) containing 10% FBS, 100 U/ml of penicillin, 100 mcg/ml of streptomycin (HyClone) and 2 mM L-glutamine (CellGro) (RPMI-complete) and counted using a hemocytometer. The concentration of purified CD4+ T-Cells is then adjusted to 3x106/mL with RPMI-complete. CD4+'s are then stimulated by culturing them with anti-CD3/anti-CD28 coupled to beads [T-Cell Expansion Kit (Miltenyi Biotec)] at a three beads per cell ratio for 72 hours at 37°C in a 5% C02 humidified incubator. Cell suspension containing stimulated CD4+ T-Cells are removed from the culture plate and counted using a hemocytometer. CD4+ T-cells (~2x106) are added to a 15 mL conical tube for use as an uninfected control. The remainder of the CD4+ T-cell suspension is placed into a 50 mL conical tube for infection. The tubes containing the CD4+ T-cell suspensions are centrifuged at 300 x g for 10 minutes and the culture supernatant is aspirated. Stimulated CD4+ T-Cells are resuspended directly in culture fluids containing virions and then spin-infected at 1200 x g for 2 hours at 20-25°C 9. Typically we infect CD4+ T-cells at a multiplicity of infection (MOI) of 5 for a replication deficient HIV strain (e.g., DHIV-3) or an MOI of 0.01 for a replication competent virus (e.g., HIV-1NL4/3). Final volume is unimportant but tubes must be balanced for centrifugation. Polybrene (Santa Cruz) is added to the culture fluid prior to spinfection at a final concentration of 10 mcg/ml. Upon completion of the spinfection, supernatants are removed and cells resuspended at a cell density of 3x106/mL in RPMI-complete supplemented with 100 U/mL IL-2. The infected and uninfected cells are culture for 72 hours if a replication incompetent virus was used to infect the cell or 5-7 days if a replication competent virus was used to infect the cells. Media should be changed every 48 hours during culture. Peripheral venous blood (~100 ml) is collected from the same donor used to isolate the CD4+ T-cells into Vacutainer Tubes containing sodium heparin (Becton Dickenson). The blood is then transferred from the Vacutainer Tubes into 50 mL conical tubes in 20 mL aliquots. The Vacutainer Tubes are then washed with 8 mL of CMF Hanks Balanced Salt Solution [HBSS (Hyclone)] and the washes are transferred to the 50 mL conicals containing the 20 mL of peripheral blood. The resulting volume in each 50 mL conical is 35 mL. The diluted blood is then layered on top of 15 mL of LSM in a fresh 50 mL conical tube and the tubes centrifuged at 400 x g for 30 minutes with the brake off. The tubes are carefully removed from the centrifuge and the resulting interface between the LSM and medium is harvested from each tube using a 10 mL pipette and placed into fresh 50 mL conical tubes. The cell suspensions are washed once with CMF HBSS (centrifuged at 400 x g for 15 minutes with the brake on). After the first wash the supernatants are removed and the resulting pellets are combined into a single 50 mL conical and washed twice with CMF HBSS (centrifuged at 30 x g for 10 minutes with the brake on) to remove all remaining LSM. After the last wash the pellet is resupended in 10 mL of ACK lysis buffer (150 mM NH4Cl, 1.0 mM KHCO3 and 0.1 mM EDTA pH 7.3) and incubated at room temp (20-25°C) for 5 mins. This step is necessary in order to remove contaminating erythrocytes from the peripheral blood mononuclear cells (PBMC). After 10 mins. 40 mL of CMF PBS is added to the cell suspension in order to stop the lysis reaction. The tube with the cell suspension containing the PBMC and lysed erythrocytes is then centrifuged at 300 x g for 10 minutes with the brake on. The supernatant is removed and the pellet is resuspended in 5 mL of PBS with 2% FBS and 2 mM EDTA and counted using a hemocytometer. The natural killer (NK) cells are then isolated from the PBMC using an NK Cell Isolation Kit [negative selection-human (Miltenyi Biotec)] according to the manufacturers instructions. The flow-through from the columns are collected in 15ml tubes and the tubes are centrifuged at 300 x g for 10 minutes with the brake on. The supernatants are removed and the pellets resuspended. The resuspended pellets are combined in one tube in a total volume of 1 mL of Iscove's Modified Dulbecco's Medium [IMDM (Gibco)] supplemented with 10% AB+ heat inactivated (56°C for 30 minutes) human serum (HS) and counted with a hemacytometer. The volume of cell suspension is adjusted with IMDM w/10% HS so that the final density of NK cells is 3x106/mL. The cell suspension is split in half. One set of NK cells receives 200 U/mL of recombinant human interleukin-2. The other set of cells is left in medium without cytokine treatment. The resulting NK cells are then used as effector cells for either a CD107a degranulation assay or 51Cr release assay. The culture fluids containing infected cells are removed from the plates and centrifuged at 300 x g for 10 minutes with the brake on. The supernatant is aspirated and the pellets are resuspended in 2 mL of PBS with 2%FBS and 2 mM EDTA and cells counted on a hemocytometer. Infected cells that do not contain HIV-1 are isolated away from the ones that harbor the virus by taking advantage of the fact that HIV-1 down modulates CD4. For this purpose CD4 Positive Isolation Kit (Invitrogen) is used according to the manufacturers instructions with the exception that one a-CD4 bead per cell ratio is used. Upon removal of the CD4+ T-cells, the dead cells are removed from the purified cell population harboring the virus using a Dead Cell Removal Kit (Miltenyi Biotec) according to the manufacturers instructions. The flow-through following dead cell removal in columns is centrifuged at 300 x g for 10 minutes with the brake on. The supernatant is removed, pellets resuspended in 1 mL RPMI-complete and the cells are counted. The purified infected cells are now ready for use as targets in a CD107a degranulation assay or 51Cr release assay. NK cell cultures are removed from plates and the cell suspension is counted. NK cell suspensions are centrifuged at 300 x g for 10 minutes with the brake on. NK cells are resuspended in RPMI-complete and the final concentration adjusted to 106 cells/mL. Cell suspensions from the isolated infected and uninfected T-cells generated in the above steps are centrifuged at 300 x g for 10 minutes with the brake on. Supernatants are removed and pellets resuspended in RPMI-complete at 2x106 cells/mL. In a 96-v-bottomed well plate 100 mcL of targets and 100 mcL effectors are added to the wells. A well containing 100 mcLof effectors and 100 mcL of medium without target cells will be used for non-specific NK cell degranulation. To each well 10 mcLFITC-conjugated anti-CD107a (BDIS) is added. The plate is then centrifuged at 20 x g for 2 minutes with the brake on. The centrifuged plate is incubated for 4 hours at 37°C and 5% CO2. After incubation the plate is centrifuged at 400 x g for 5 minutes with the brake on. The supernatant is removed from the pellet. After the 20 minute incubation, 200 mcL of flow buffer is added to each well and the plate is centrifuged at 400 x g for 5 minutes with the brake on. The flow buffer is then carefully aspirated from each well using a 2 mL aspirating pipet fitted with a 200 mcL micropipet tip while making sure not to disturb the pellet. Step 15 and 16 are repeated once more. Pellets are resuspended in 200 mcL of 1% paraformaldehyde in CMF PBS. The cell suspensions are then transferred to flow tubes. Total volume is brought up to 300 mcL by adding ~100 mcL of 1% paraformaldehyde in CMF PBS to each tube. The events (2x104) corresponding to NK cells are collected by a flow cytometer using the FACS DIVA(BDIS) software for acquisition and analyzed using Flow Jo software(TreeStar). Single cell gates are created using a forward scatter height (FSC-H) vs forward scatter width (FSC-W) plot. For size versus granularity plot a FSC vs side scatter (SSC) plot is created on the single cell gate. Typically lymphocytes have relatively low granularity and medium cell size. The cells in the lymphocyte gate are then plotted in a dot plot of CD3/14/20 stained cells vs. CD56 stained cells to gate on the NK cells while omitting monocytes (CD14), T-cells (CD3) and B-cells (CD20). The CD56pos gated population is then evaluated for CD107a. The NK cells without targets group is used to set the gates for what is considered CD107a negative. While target cells are labeling, previously isolated NK cells are removed from culture and counted. Cell cultures containing NK cells are centrifuged at 300 x g for 10 minutes with the brakes on. Pellets containing NK cells are resuspended in RPMI-complete and split into 3 tubes. The cell density is adjusted to 105/mL in one tube, 2.5x105/ml in the second tube and 5x105/mL in the third tube. Labeled targets cells are removed from the incubator and 4.5 mL of RPMI-complete is added to each tube. Tubes are then centrifuged at 300 x g for 10 minutes. Supernatant is poured off carefully as not to disturb the pellet into a container for radioactive liquid waste. Steps 4 and 5 are repeated twice more to remove all unabsorbed 51Cr. Supernatants from the third wash may be disposed of in a container for non-radioactive liquid waste. Labeled targets are then resuspended in RPMI-complete to a final cell density of 105/mL. 100 mcL of labeled targets are aliquoted into wells of a 96-v-bottom well plate for a final cell number of 104 target cells/well. Table1 is an example of a typical setup for a 51Cr release assay. Each group is done in triplicate. 100 mcL of the above NK cell suspensions are added to each well containing target cells. 100 mcL of targets are added to corresponding wells in which effector cells are absent for the maximum and spontaneous release groups. The spontaneous release group is incubated with an additional 100 mcL of RPMI-complete. The 96-well plate is centrifuged at 20 x g for 2 minutes with the brake on. The centrifuged plate is then incubated at 37°C and 5% CO2 for 4 hours. After the 4-hour incubation 5 mcL of a 1:10 dilution of human red blood cells in RPMI-complete is added to each well except the maximum release wells. 100 mcL of 10% sodium dodecyl sulfate is added to the maximum release wells. The plate is centrifuged at 400 x g for 5 minutes to pellet the cells. 100 mcL of cell-free supernatant is harvested from each well and placed into separate gamma-counter tubes (Perkin Elmer). The tubes are placed in a 2470 Automatic Gamma Counter (Perkin Elmer). The amount of 51Cr present in the culture fluid is measured as counts per minute from the average of a 2-minute reading. Figure 1. Steps involved in the isolation of natural killer cells and the generation of HIV-1 infected target cells from the peripheral blood. Figure 2. 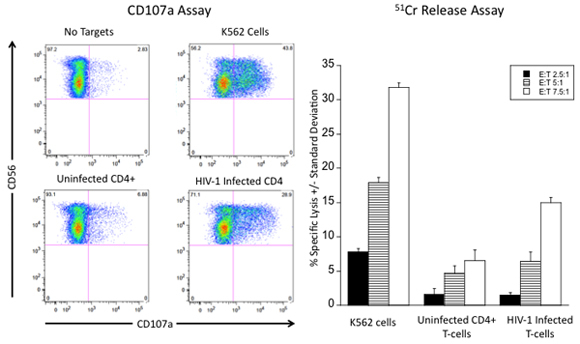 Steps involved in the construction of a CD107a degranulation assay utilizing NK cells as effectors and K562 cells, uninfected CD4+ T-cells and HIV-1 infected T-cells as targets. Figure 3. 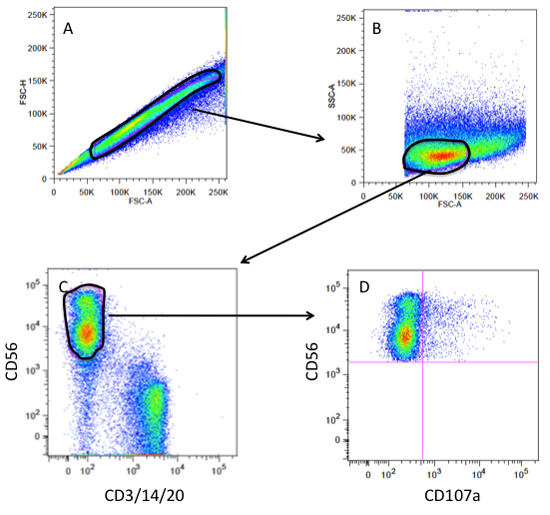 Flow cytometry-gating strategy for a CD107a degranulation assay. (A) Gating on single cells and excluding clumps or doublets on a plot of FSC-A (forward scatter area) vs FSC-H (forward scatter height). (B) Single cell gate plotted as FSC-A vs SSC (side scatter) gating on the lymphocyte population. (C) Lymphocyte gate plotted as CD3/14/20 (T-cells, monocytes, B-cells) vs CD56 (NK cells) gating on the CD56pos andCD3/14/20neg population (NK gate). (D) NK gate plotted as CD107a vs CD56 to visualize NK cells that have degranulated (CD107apos). Figure 4. Steps involved in the construction of a 51Cr release assay utilizing NK cells as effectors and K562 cells, uninfected CD4+ T-cells and HIV-1 infected T-cells as targets. Figure 5. Representative results for assessing the cytotoxic response of natural killer against HIV-1 infected cells. (A) NK cells were evaluated for their ability to degranulate without targets and in response to K562 cells, primary CD4+ T-cells and HIV infected primary T-cells as assessed by the percentage of NK cells that express surface CD107a. The numbers in each quadrant represent the percentage of total NK cells. B) NK cells are evaluated for their ability to lyse K562 cells, uninfected CD4+ T-cell and HIV-1 infected T-cells in a 51Cr release assay at different effector cell to target cell ratios (E:T). When done correctly the assays described in this protocol should provide a representative picture of NK cells ability to degranulate against and lyse HIV-1 infected cells (see Figure 5). NK cell degranulation in response to HIV-infected cells and the NK cells lysis HIV-infected cells should be directly proportional10. Reliable results for the two NK cell functional assays to measure cytotoxic responses to HIV-infected cells are dependant on the isolation of highly purified NK cells as well as a highly purified population of infected cells. Having purified NK cells and HIV-1 infected cells are critical for the achievement of a fairly accurate effector to target cell ratio. Similarly, removal of dead and apoptotic cells from the target cell populations is important before 51Cr labeling or incubation with the effector cells. 51Cr may be internalized by cells that are undergoing apoptosis as the presence of dead or apoptotic cells during the isotope labeling step will result in a high spontaneous release and will distort the calculated % specific lysis. Moreover, the presence of dead or apoptotic cells may trigger NK cell degranulation resulting in abnormally high levels of CD107a expression. Precise pipetting is necessary when removing the cell-free supernatants following the incubation of NK cells and target cells in the 51Cr release assays, as differences in the volume of supernatant removed from each replicate well will result in high standard deviations. Modifications can be made to these protocols to evaluate the role of specific NK receptors in triggering NK cells lysis of HIV-infected cells by incubating the effectors or targets prior to co-culture with antagonistic antibodies to specific receptors or ligands 6,11. Cytokine-treated NK cells (e.g., IL-2, IL-15) can be used to evaluate the functionality of stimulated NK cells 12. Similarly, antibody dependant cell cytotoxicity assays may be performed using these protocols. Anti-HIV antibodies (e.g., anti-gp120) can be added to the target cells for recognition by the NK cell low affinity Fc receptor CD16 13. These assays, although set up to measure NK cell cytotoxic responses to HIV-infected cells, can also be modified to measure the ability of NK cells to produce cytokines following HIV-infected cell recognition. Although we described in this protocol the use of in vitro infected cells as target cells we have recently described the generation of target cells from patients infected with HIV. This requires the isolation of CD4+ T-cells followed by expansion of the cells over a two week period following stimulation with mitogens in the presence of interleukin-2 11. After the two week period of expansion, the protocols described in this article are used to isolate the target cells. Ruscetti, F. W. Analysis of effector mechanisms against HTLV-I- and HTLV-III/LAV-infected lymphoid cells. J Immunol. 136, 3619-3624 (1986). Zheng, Z. Y., Zucker-Franklin, D. Apparent ineffectiveness of natural killer cells vis-a-vis retrovirus-infected targets. J Immunol. 148, 3679-3685 (1992). Ferrari, G. Clade B-based HIV-1 vaccines elicit cross-clade cytotoxic T lymphocyte reactivities in uninfected volunteers. Proc Natl Acad Sci U S A. 94, 1396-1401 (1997). Shankar, P. Impaired function of circulating HIV-specific CD8(+) T cells in chronic human immunodeficiency virus infection. Blood. 96, 3094-3101 (2000). Ward, J. HIV-1 Vpr triggers natural killer cell-mediated lysis of infected cells through activation of the ATR-mediated DNA damage response. PLoS Pathog. 5, e1000613-e1000613 (2009). Ward, J. HIV modulates the expression of ligands important in triggering natural killer cell cytotoxic responses on infected primary T-cell blasts. Blood. 110, 1207-1214 (2007). Bonaparte, M. I., Barker, E. Killing of human immunodeficiency virus-infected primary T-cell blasts by autologous natural killer cells is dependent on the ability of the virus to alter the expression of major histocompatibility complex class I molecules. Blood. 104, 2087-2094 (2004). Stinchcombe, J. C., Griffiths, G. M. Secretory mechanisms in cell-mediated cytotoxicity. Annu Rev Cell Dev Biol. 23, 495-517 (2007). O'Doherty, U., Swiggard, W. J., Malim, M. H. Human immunodeficiency virus type 1 spinoculation enhances infection through virus binding. J Virol. 74, 10074-10080 (2000). Alter, G., Malenfant, J. M., Altfeld, M. CD107a as a functional marker for the identification of natural killer cell activity. J Immunol Methods. 294, 15-22 (2004). Fogli, M. Lysis of endogenously infected CD4+ T cell blasts by rIL-2 activated autologous natural killer cells from HIV-infected viremic individuals. PLoS Pathog. 4, e1000101-e1000101 (2008). Tomescu, C., Chehimi, J., Maino, V. C., Montaner, L. J. NK cell lysis of HIV-1-infected autologous CD4 primary T cells: requirement for IFN-mediated NK activation by plasmacytoid dendritic cells. J Immunol. 179, 2097-2104 (2007). Ward, J. P., Bonaparte, M. I., Barker, E. HLA-C and HLA-E reduce antibody-dependent natural killer cell-mediated cytotoxicity of HIV-infected primary T cell blasts. Aids. 18, 1769-1779 (2004).